Objects are all around us - and images of objects, advertisements for objects. Things are no longer merely purely physical or economic entities: within the visual economy of advertising, they are inescapably moral. Any object, regardless of its nature, can for at least a moment aspire to be "good," can become not just an object of value but a complex of possible happiness, a moral source of perfection for any one of us. Our relation to things, Coccia, argues in this provocative book, is what makes us human, and the object world must be conceived as an ultimate artifact in order for it to be the site of what the philosophical tradition has considered "the good." Thinking a radical political praxis against a facile materialist critique of things, Coccia shows how objects become the medium through which a city enunciates its ethos, making available an ethical life to those who live among them. When we acknowledge that our notion of "the good" resides within a world of things, we must grant that in advertising, humans have revealed themselves as organisms that are ethically inseparable from the very things they produce, exchange, and desire. In the advertising imaginary, to be human is to be a moral cyborgs whose existence attains ethical perfection only via the universe of things. The necessary alienation which commodities cause and express is moral rather than economic or social; we need our own products not just to survive biologically or to improve the physical conditions of our existence, but to live morally. 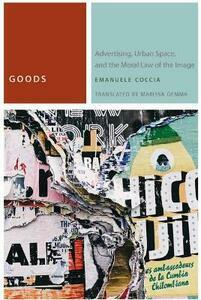 Ultimately, Coccia's provocative book offers a radically political rethinking of the power of images. The problem of contemporary politics is not the anesthetization of words but the excess power we invest in them. Within images, we already live in another form of political life, which has very little to do with the one invented and formalized by the ancient and modern legal tradition. All we need to do is to recognize it. Advertising and fashion are just the primitive, sometimes grotesque, but ultimately irrepressible prefiguration of the new politics to come.